One of the things I often like to say (but don’t often say) is that “you always know if it’s a Spoon song, Spoon sounds like no one else and no one else sounds like Spoon”. Did that quite make sense? I don’t know, what I’m essentially saying is that Spoon as a band are undeniably unique. Nine albums in, the Austin band is still going strong. Hot Thoughts, their latest offering seems to have taken a new electronic direction while still sounding like Spoon and it’s very good. Naturally they are touring the album and played the prestigious Massey Hall on Tuesday night in support. July 2010, Molson Amphitheatre – This was a good set, but was overshadowed by the absurdly entertaining Flaming Lips show that happened after. They did bring out a horns section for the Underdog, if I remembered correctly, which was great. NXNE 2014, Horseshoe Tavern – An amazing show with sad consequences, NXNE clearly blew their load that year and has been a mere shallow shell of itself since. Still, this show made everyone in the Horseshoe feel special as a band that popular should not have been playing a venue that small. SXSW 2015, Moody Theatre – My favourite Spoon show of all time. This was a homecoming show of epic proportions, in a gorgeous venue and with Britt Daniel’s parents in the crowd. Don’t get me wrong, Spoon plays SXSW almost every year but this one just felt special. June 2015, Phoenix – Honestly forgot I went to this show until I checked my google docs. 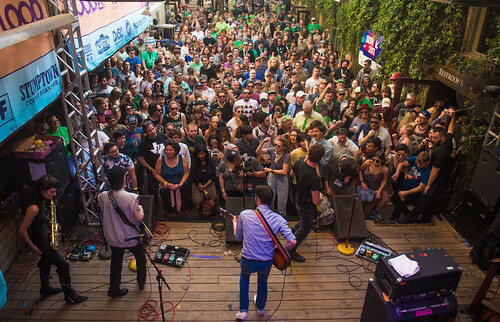 SXSW 2017, Austin Convention Center – Spoon played like seven SXSW shows this year to support Hot Thoughts. We picked one that might have been a bit different – a performance in a hall at the convention center. Mostly we picked this show because it was air conditioned and indoors. The show was good and introduced some tracks from Hot Thoughts that we knew would always be in the concert rotation once we heard it live. So with that in mind, the Spoon show on Tuesday was like meeting an old friend again. With over 24 years of experience, Spoon is no doubt very good live. They have a very workmanlike attitude with barely any banter in between songs (save for a weird piano number that gave everyone on stage a break) and their live interpretation of their songs has enough looseness to it that you know that you aren’t listening to the album version really loud. Britt Daniel is an energetic front man, with good stage coverage and the occasional rock and roll pose. As you would expect, the set mixed new and old and newer songs such as “Hot Thoughts” and “Do I Have To Talk You Into It” sound like instant classics. The first with almost a disco vibe to start and the latter with your classic Britt Daniel raspy vocal delivery that also serves as the rhythm of the song. Most of the classics got played and everyone had a good time. But you know what? As I was listening to the concert, a thought occurred to me. Spoon doesn’t have an anthem. Maybe it’s just me, but they don’t actually have a song where everyone is singing along to every word. That seemed awfully strange until I mentally went through their back catalog, and it’s pretty true. You know that moment that happens often in shows when the lead singer hands the mic over the crowd and everyone is singing along? That NEVER happens at a Spoon show. In no way does it detract from a Spoon set, but I found that to be a bit mind blowing. What is it about Spoon tracks that prevent it from being completely anthemic? Anyways, a hot take on Spoon, or maybe completely irrelevant. 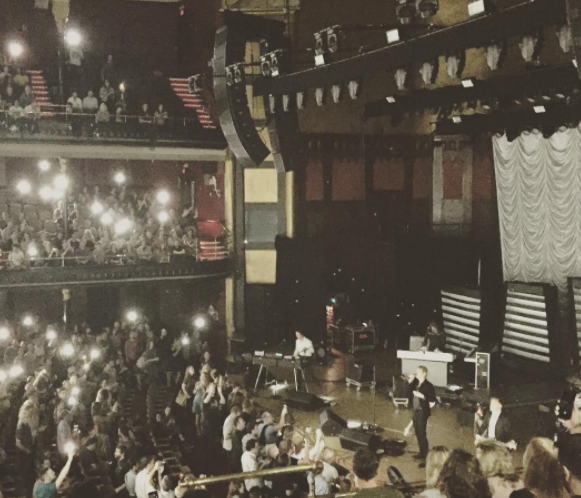 Anyways, anthem or not, it’s hard to beat Spoon at Massey Hall. Spoon - The local band made a big impact at SXSW, hosting a residency throughout the week to introduce people to their excellent new album Hot Thoughts. It was impossible to miss them and frankly, why would you miss them? Spoon has consistently been good and this year was no different. Their show mixed new and old, and even with the new synth driven sounds, it’s still a Spoon song in it’s essence. One of the things I like to say about Spoon which might be generic and lazy is that there is no other band that sounds like Spoon and even as the group explores it’s sound, I think that will always be true. Black Lips – Gone are the days when the Black Lips play insane shows where bodily fluids flew about like an Indian Monsoon. The group is older but still a ton of fun and they proved it with a fun, rocking show at the Cedar Courtyard. The short set featured some new songs and some old classics like “Oh Katrina” and “Bone Marrow.” Even in a tight environment like the Courtyard, the group found space to be creative with Jack Hines sliding off the stair rails to start the show off. For the Black Lips fans that braved their way to the front, they were also treated to some free donuts as well, which is nice. New Pornographers – If the showcase I witnessed is any indication, the new New Pornographers album will see the band tackle new sonic landscapes with a more synth driven sound. Given their past track record, I say, why not? It was nice to see Neko Case back in the fold at Stubbs on Wednesday night as she joined the group to promote new records and relive old classics. Hearing Neko sing “Mass Romantic” is rather nice although I’ve heard non Neko for so long now it’s kinda of jarring. Ramesh - For me, I’ll always wonder what happened to Voxtrot. Ramesh’s former band started off with an amazing EP but was unable to maintain momentum. Since then I have seen Ramesh’s name bandied about the music circle but he has yet to establish the foothold he once had. Still Ramesh’s showcase on Tuesday showed flourishes of what made me like Voxtrot – well written songs that buoy between happy and sad while navigating an 80’s pop-inspired musical landscape. The set was good and perhaps this configuration of the band will see success once again. Supermoon - An all female quartet from Vancouver, Supermoon played fun, guitar driven, almost East Coast sounding rock music at the Canada House on a semi warm afternoon. Clearly a new band, the group showed potential while also showcasing a dry humor and actually ran out of songs rather quickly, despite the crowd wanting more. Not a bad start.